Using a variety of supports and formats such as performance, installation, painting, sculpture and drawing since the mid-1970s, Pope.L has made use of humor and irreverence as some of his critical tools. Some of his core research topics are the issue of race in the United States, the reflection of social structures in public spaces and the privileges of certain social groups. 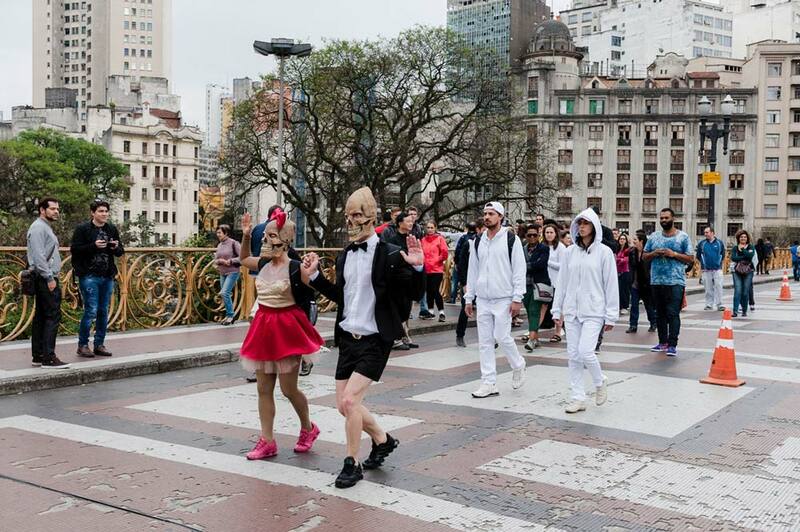 For the 32nd Bienal, the artist developed a pedestrian circuit for São Paulo in the performance Baile [Ball] (2016). From September 7 to 10, a group of participants walks through the city, crossing areas marked by deep socioeconomic disparities. The performance dialogues directly with Blink (2011), an action that took place in New Orleans, USA, after Hurricane Katrina. On that occasion, the artist gathered volunteers to push a truck whose rear was used as a screen for the projection of photos of the city, calling attention to the need for collective action after the disaster.